WARNING: This is a preview of Crab Dash. All components and rules are prototype and subject to change. tl;dr: Underground gambling based on hermit crab racing without the cigar smoke and fear of raids. The execution of this game's theme is nearly perfect, leading to a ridiculous experience. Getting to the Game: This is, above all things, a gambling simulator. As such, components and rules will be very familiar to anyone who's ever been to a racetrack. The board depicts a sand circle, and six beautifully-illustrated hermit crabs start in the center. Betting locations are set along the outside of the track, and just to keep the game from being a complete luck-fest, you'll shuffle and deal out three Power cards to each player. You'll choose a first player, and players lower in the turn order will get additional currency to compensate them for having late access to betting. In our games, going later didn't feel awful, and might even be an advantage given that you get to see which of the crabs starts out well. 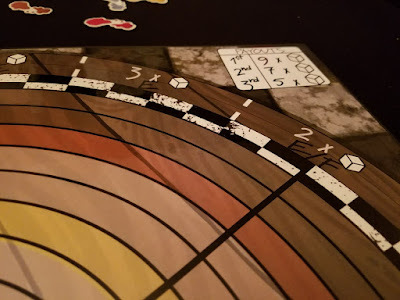 The rules are mostly clear, but there are fairly reasonable edge cases of interactions that came up that aren't addressed in the rules, leading you to make some relatively intuitive deductions. 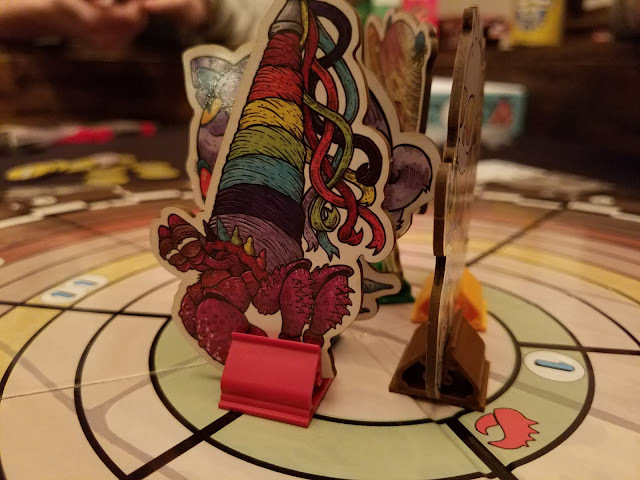 They're not frustrating enough that houseruling them feels awful, but given the simplicity of the game, I find it very hard to believe that the playtesters didn't have the same questions we did. Movement of the individual crabs is dictated by three custom dice being rolled and their instructions executed. After that, the player has two actions with which to play cards or place bets (using "pearls" as currency, a nice touch). The better a crab is doing, the more it will cost you to bet on them. Anyone who's even vaguely familiar with horse racing will catch on quick to the rules. 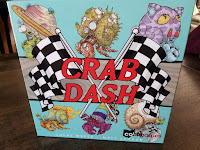 Playing the Game: Crab Dash sits in a very pleasing zone for my gaming tastes. As a gambler myself, it does a surprisingly good job of scratching that itch of maximizing the investment of a bet, and provides a few options to choose from. You can bet on individual crabs, the cost of each bet getting higher as the crabs move further outward from the center, or you can bet on which lane the top three crabs will climb across. 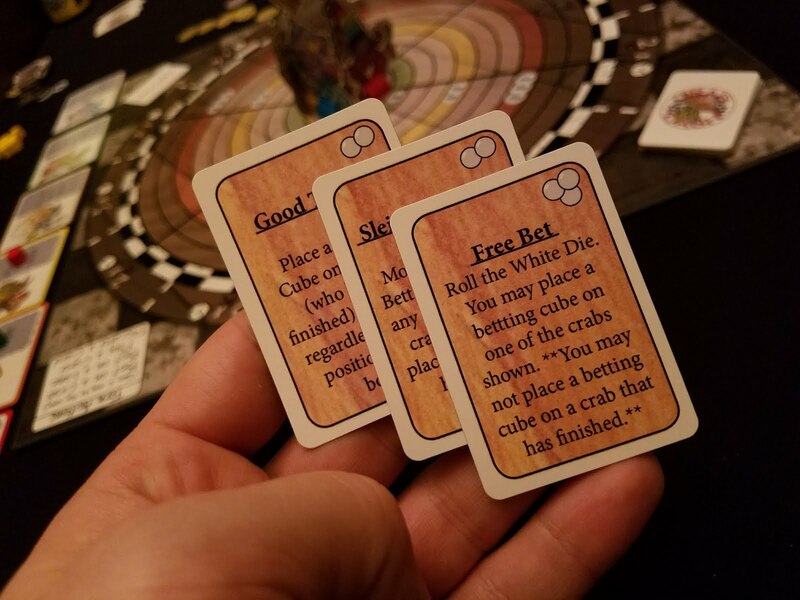 Even with all the options, you'll curse every player who gets a chance to bet on crabs just about to finish while you wait for the dice to come around to you. 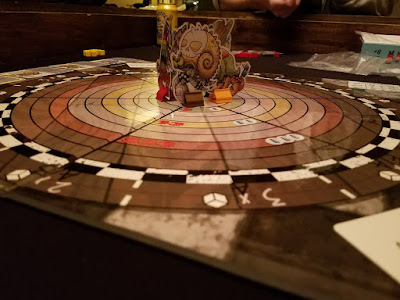 Strangely, in all of the games we played so far, a single crab has rocketed out of the gate only to completely stop short of the finish and allow others to catch up. Additionally, players have cards that force people to re-roll the dice, or even physically move crabs back or forward, so there's plenty of opportunities to even the race. Given that crab movement is completely at the whim of a d12 and 2 d6's, it was a breathlessly fun thing to pass the dice to a new player, everyone at the table both being completely sure that a crab was about to win and also praying to whoever they could think of that it didn't. Since dice rule the game here, it's entirely possible that Crab Dash turns into a non-interactive experience. It's possible that even with a totally random set of crab movement, since you're betting on which crab finishes the race and also where they finish, this game would still be very fun. However, designer Weese has added some fun elements that bring a bit more to the match. The first and most influential of these elements is the deck of Power cards. 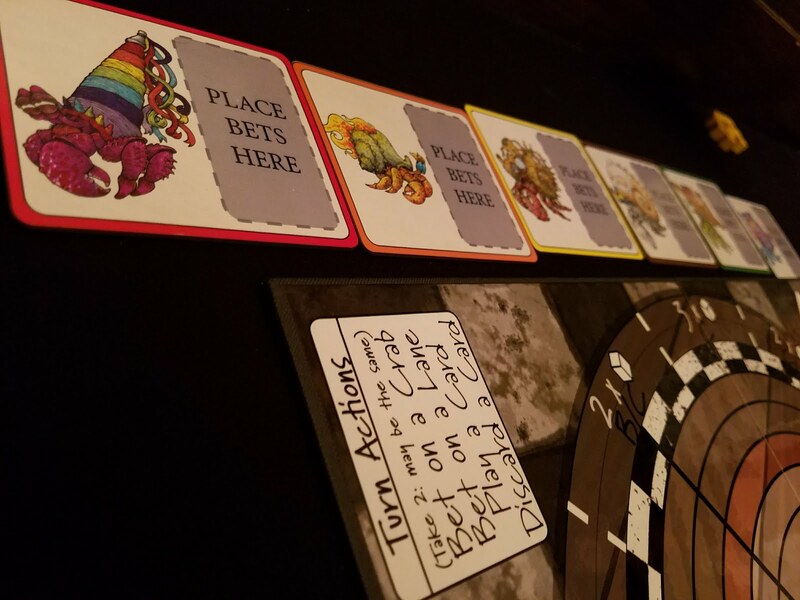 Each player begins the race with three cards, and one side of the action dice allows players to draw new ones. Effects vary wildly from encouraging a crab to move up a space, to getting a free bet down on any crab who hasn't finished yet. 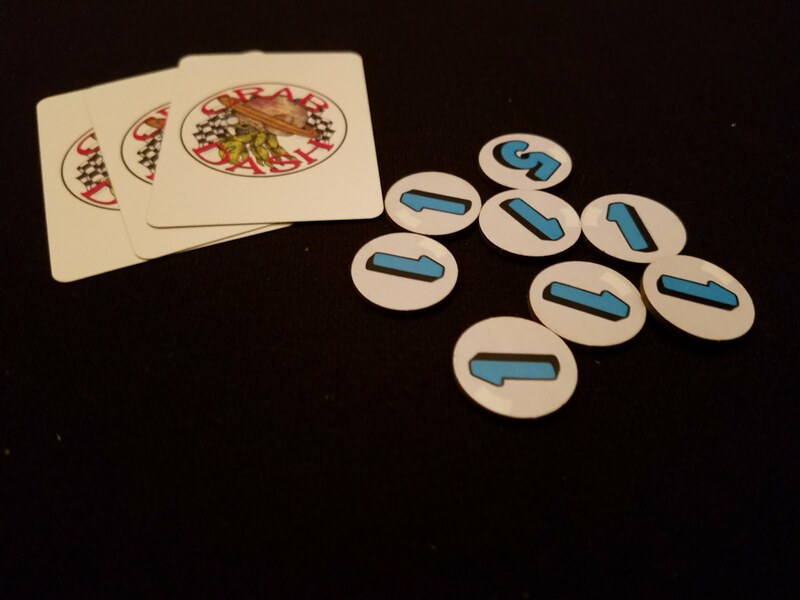 Some of the cards are Events, which are played immediately, and force the crab in last place to move up or drag the winning crab back with the rest of the group. And, even if your card is dead for whatever reason, you can discard it as an action on your turn to gain pearls. It's just enough nudging of the game to feel fun without breaking the spirit. Players are paid out based on the top three crab racers with decreasing payouts as they cross the finish line. Placing bets on a single lane pay out at 3-to-1, but you can straddle two lanes for a 2-to-1 payoff. Followers of actual horse or dog racing might scoff at the lack of odds here or tell you that real racing isn't actually random, that there's always conditions to consider and how some animals have more natural predilections towards certain conditions, and on and on. I personally love thinking that the developer thought about those complaints and said, "Fine. I'll make it about hermit crabs." The random nature of the movement and the tendency of crabs to just suddenly stop moving for a long period of time is perfectly in theme, and it leads to some really frustrating/amazing/exciting/delightful moments. 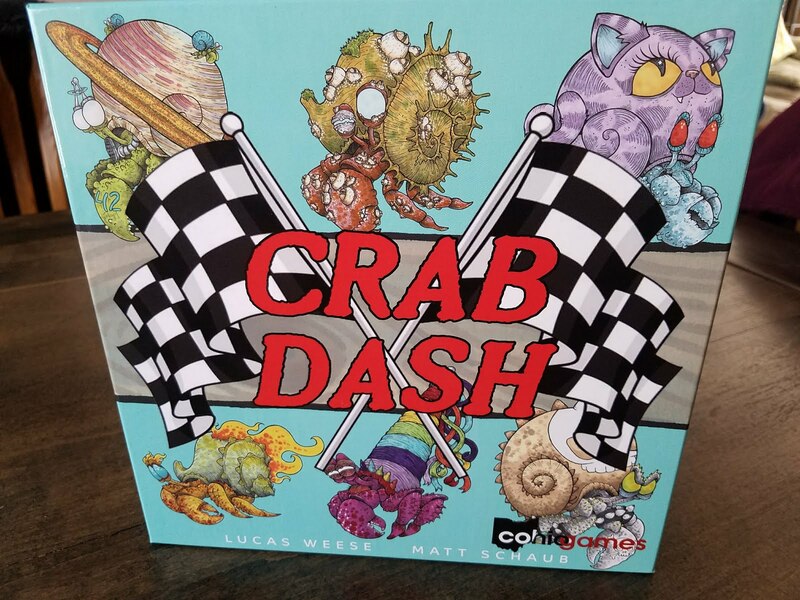 Artwork and Components: As this is a preview copy of Crab Dash, I'm not certain which of the boxed components are final. I'll say that the crabs look phenomenal to the point of making all the other components look bad. The dice included are obviously not finished product, so there's a good opportunity there to add even more fun. The pearl tokens look simply okay, and the betting cubes are colored wood. It feels uneven in production right now, and I'm hoping the retail version addresses this. The box art is awful and the instructions leave a lot to be desired, both in presentation and content. It is however, labeled as a "racing form," which I thought was a nice touch. The Good: Crab artwork is top notch. Just enough influence through well-thought-out additions to the base gambling idea to make it not feel cheap or random. Play time is just right, and the actual gameplay leads to some really exciting moments. The Bad: Component quality is uneven, and the instructions lack explanation of common game occurrences. The actual race is almost totally dependent on dice rolling, so luck-averse players are cautioned to stay away. 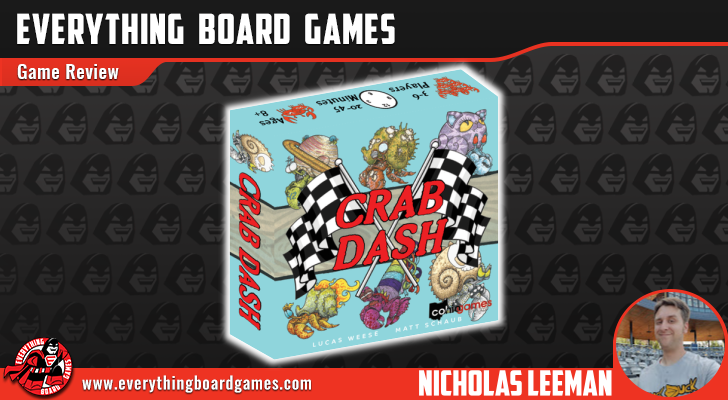 Score: Crab Dash is a tense, frustrating, but ultimately very fun and dare I say even raucous experience. The play is fast, so even with 6 players there's little downtime. Crab Dash will fit nicely as a quick change of pace in anyone's collection. I'm giving Crab Dash a score of Worth the Gamble. On KICKSTARTER between now and February 17, 2018. Thank you for the review and the rating you gave it fits perfectly. We're working with the artist and a graphic designer to get the box up to snuff. We've definitely made changes to the rulebook and it is a continually evolving experience.